What you probably knew already was confirmed on Wednesday, Giancarlo Stanton is done for the season. On Tuesday Stanton said that he was hoping to play again this season and he posted a picture showing his improvement over the week. Stanton got hit in the face by a fastball from Brewers pitcher Mike Fiers last Thursday. You could tell that Fiers was shaken up after the accident, as he went on to hit Reed Johnson, which caused a brawl. Stanton suffered facial fractures and dental damages, along with having to get stitches and two black eyes. Stanton health is the primary concern for the Miami Marlins, who are out of playoff contention. Stanton is an NL MVP candidate, finishing this season with a .288 average, 37 home runs, and 105 RBIs. Stanton would win the MVP if Clayton Kershaw wasn’t having such a great season. 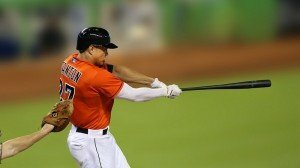 Stanton will play in Miami for at least two more years, as he becomes a free agent after the 2016 season. Stanton is a great player and will be important for what I think could be a big season for Miami in 2015. Miami fans should be pleased that he’s recovering so quickly and that their shutting him down for the rest of the season. There is no need to put your star player at risk. Stanton will more than likely wear a protective helmet next season, portably like the one that Jason Heyward of the Atlanta Braves wears.